Last weekend’s fruit tasting event provided me with an opportunity to sample many rare and unusual heirloom apples that were popular decades ago, but are pretty much nonexistent in today’s marketplace. It’s pretty amazing to come across so many heirloom apples that you’ve never seen or tasted before. Walk through your local grocer and you’ll predictably find the standard Red and Yellow Delicious apples, Granny Smiths, Fujis, Galas, and if you’re really fortunate there may be three or four other varieties to choose from. At the fruit tasting I was face to face with somewhere in the neighborhood of a hundred different varieties of heirloom apples. Unfortunately most of them would be more at home in a museum than at the supermarket. And even worse, relatively few people ever have an opportunity to discover the appetizing aromas, flavors, and uses that these heirloom and antique treasures offer. There were red apples, russets, stripped apples, red fleshed ones, and others with a yellowish, cream-colored, or even red streaked interiors. The heirlooms also came in various shapes and sizes, from gigantic sized spheres down to tiny crab apple sized fruits. While most of the antique apples displayed the typical apple shape, some were pear, bell, or conical shaped and I noticed one that wasn’t round at all, but instead it was long and slender like a plump baby zucchini. The delightful flavors ranged from intensely sweet, to extremely tart, with some apples having a curious combination of both sweet and tart characteristics. Some of the heirlooms yielded spicy, exotic aromas and flavors, while others offered up faint hints of familiar fruit flavors and scents. No matter what your preference, you were bound to discover plenty of apples to stimulate your taste buds. 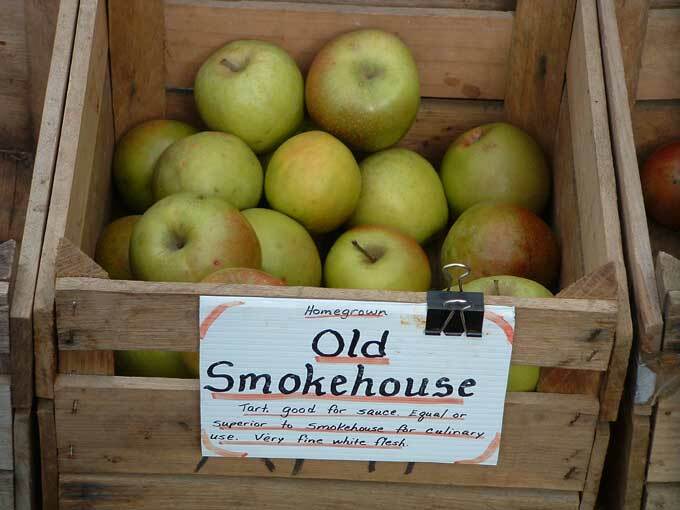 There were outstanding keepers also; apples that could be stored for close to a year without spoiling, the whole while improving in flavor as they aged. Another interesting trait that was brought up in a conversation related to the manner in which an apple’s flavor, like grapes or wine, can vary from one year to the next. So an apple that was your favorite one season may be second best the next. Some heirloom apples are ideal for sauces, cider, and cooking, including varieties that would no doubt be perfect for that apple pie recipe that’s been handed down in your family for generations. In fact, one of those heirloom apples could very well be “the apple” that was originally used when that cherished pie was first created. In spite of their rich histories, legendary reputations, and incredible flavors, you’d be hard pressed to actually sink your teeth into these rare apple varieties. Part of the problem is created by a commercial system of agriculture that caters to produce that is easier to grow and market because it all looks the same, ships easily, and matures and can all be harvested at one time. Another strike against heirloom apples is caused by the lack of demand from consumers who are unaware of their existence, and don’t realize what they’re missing out on. It’s easy to think that an apple is an apple, without realizing the interesting variations in taste and function that exists between them. Then there’s the small matter of appearance. Some of the heirloom apples wouldn’t be allowed anywhere near a beauty contest. As you’ll see for yourself in my next entry, some of the best tasting heirloom apples are pretty ugly to look at. So even if given a choice most people would step right over an amazing heirloom treasure, grab a shiny and attractive Red Delicious apple, and never know what they had passed on! The good news is that there are private growers and small local orchards still raising heirloom apples. 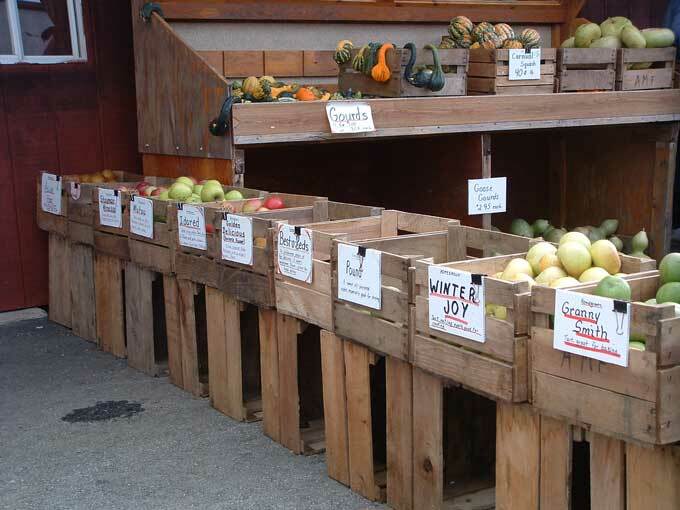 Check the phone book and take a drive out into the country this weekend, you might be surprised to find what you can discover in the way of antique apples that are growing nearby. And if you’re contemplating planting a few apple trees of your own, rather than grow yet another one of the assorted “Delicious” apple trees, consider growing an antique selection that will bring a little variety and a lot of history right into your own backyard. This post has been submitted as part of the Weekend Herb Blogging for the week of October 29th, 2006. In the next entry I plan to share some of the antique apple varieties that I sampled at the recent Backyard Fruit Growers event, and later I’ll also share a few excellent sources where you can obtain antique and heirloom apple trees to plant and create your own fruit garden. Very interesting. I’m familiar with quite a few heirloom tomatoes, but never heard of heirloom apples. I bet they’re wonderful. Great article. One of the things I miss from the Midwest are the Harralson apples. One of the things I love about living here are all the old, wild apple trees. Haven’t a clue whether they’re heirloom or not…but I love apples. I’ve been eating my ‘apple a day’ since I was old enough to chew – and my mother carefully peeled them for me – can you imagine? Grant, thanks for asking and yes you may use the heirloom apple photo for your school project. Can anyone tell me where to purchase a sampler collection of heirloom apples? I would need to have them boxed and priority mailed to Alaska. I would love to try some! 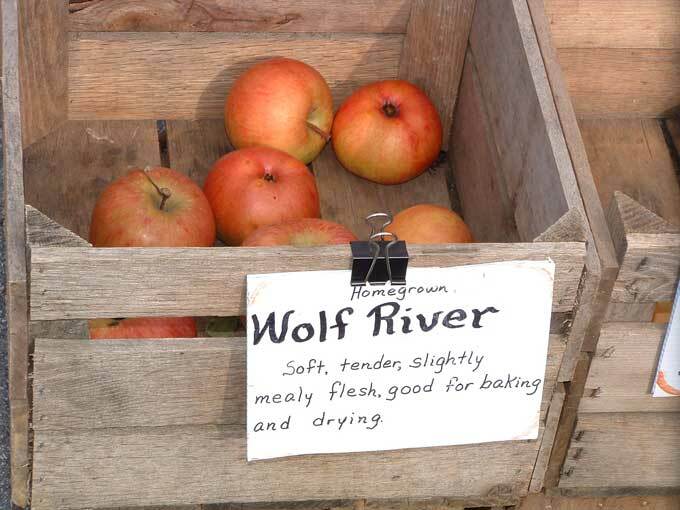 We may have local salmon, moose and blueberries but we are FAR from good apples! Thanks! Hello Sue, try St. Lawrence Nursery in NY. 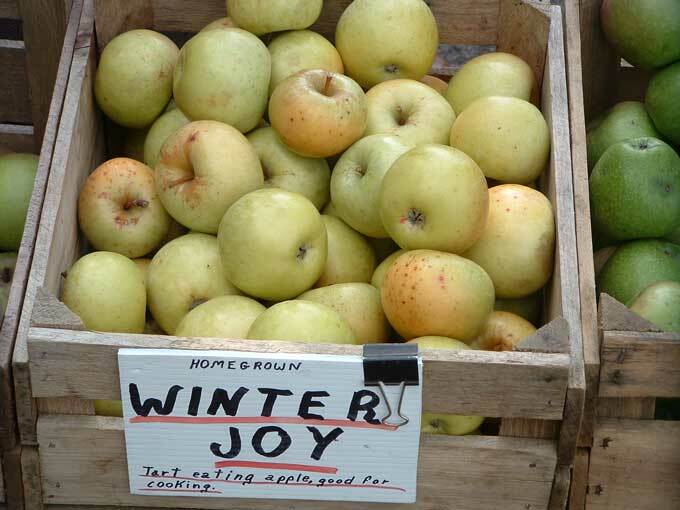 They specialize in apple trees for northern climates and the do offer some packages of heirloom apple trees. 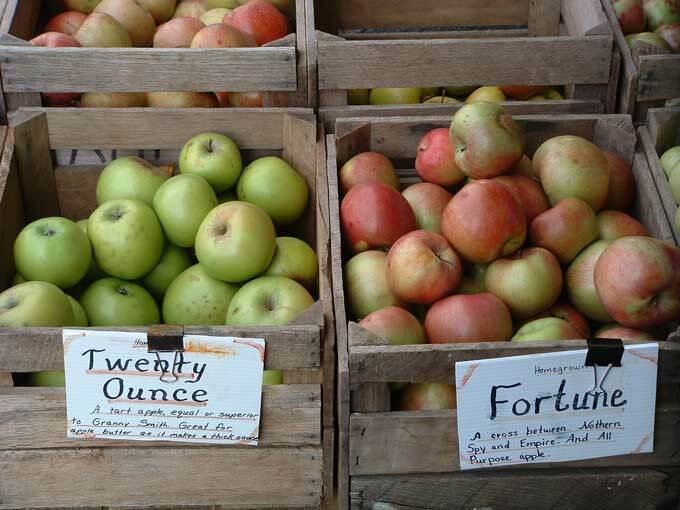 What were your favorite antique apples? What was your opinion of newtown pippen and esopus spitzenberg? Rudy, some of my favorite apples are York Imperials, Ashmead’s Kernel, and many of the russet varieties. Pippen and Spitzenberg taste great but they are not the easiest apple to grow if your climate and growing conditions are to their liking. Varieties such as the York Imperials and Pomme Gris are less challenging to grow here in Pennsylvania.